The aftermath of the Tripura elections has been mayhem and violence which has also resulted in the toppling of Lenin’s statue. It is painful to see the glorious victory being celebrated in such a manner. The comments of the Governor and the sundry politicians are worse. The Minister said that the statue will be replaced with a Gandhi statue. I personally feel it would be better if we put up a statue of Gandhi and our other icons alongside the statues put up by the Left government. This has happened before, and happened in Odisha. In a small corner of rural Odisha, both these great men rub shoulders. 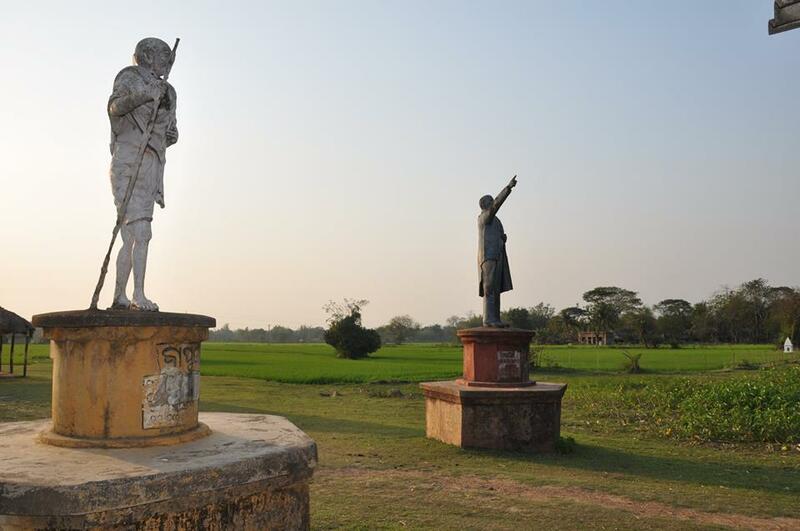 In the village of Dandi near Basta in the Balasore District, just by the side of the road, are two statues that were put up in 1984. 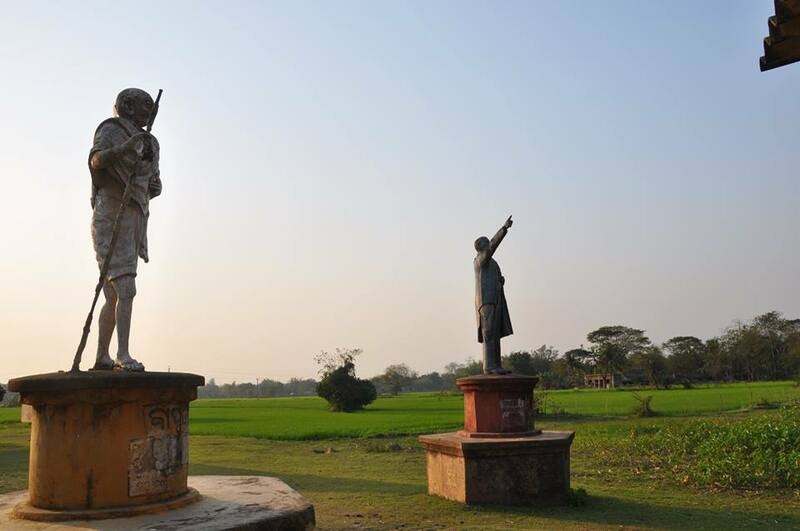 The sight of the statues is a heartwarming one, an example of the might of the human spirit. There is an interesting history behind the two statues. The area was a bastion of the Communist Party for years. Sometime during the heydays of Indo-Russian co-operation, the local unit of the Party invited the Consul General of Russia at Kolkata to put up a statue of Lenin in the village. When D-Day came near, the babus at Bhubaneswar saw red. They put a halt to the programme, but the minor diplomatic storm in the teacup made the Centre intervene. It was finally decided that the Consul General would inaugurate two statues, one of the Mahatma along with Lenin. A same size statue of the Mahatma was hurriedly procured and set up along with Lenin’s statue. The two statues were inaugurated amidst much fanfare, and the place has since been known as the Lenin Chhak. This is perhaps the only place in the world where the apostle of peace and the radical communist share space. 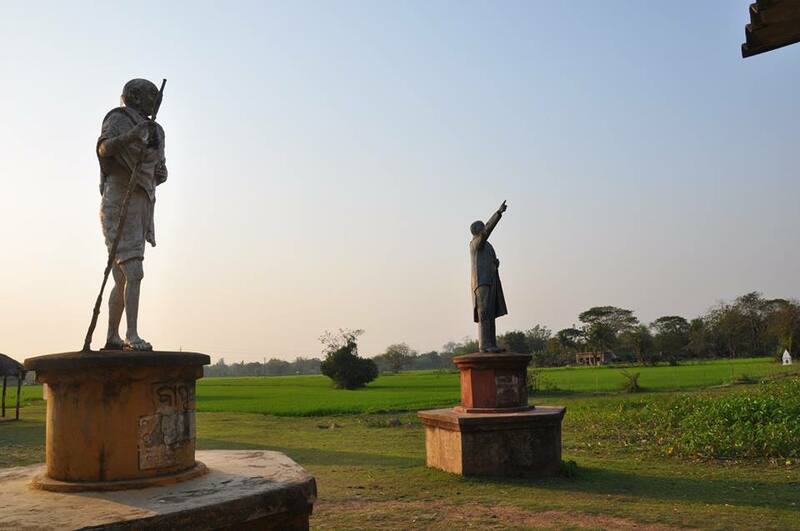 The pedestals are on two small platforms, a distance of 20 feet from each other, set up in the premises of a now abandoned school, on the edge of the rice fields. Both are of similar height, looking ahead in their typical depictions. A visibly annoyed Gandhi, the pilgrim soul, is ceaselessly on the march in a journey which seems to be without end. With the staff of the traveler in one hand, the other probably holding the Bhagvad Gita, he is moving towards a distant light which guides him to peace, brotherhood and a world bereft of hatred. Lenin has his right arm extended forward, and the hand is also extended, pointing forward with the index finger. The left hand is holding the seam of his greatcoat. The general image of the Lenin statue as pointing ahead was so prevalent that it became common. Lenin and Gandhi are the two greatest personalities in modern history who are known for the enormity of the suffering they had undergone and the changes they got for more than half of humankind. Both are remembered for their tireless pursuit of truth, and their great passion for the poor and the oppressed. They were revolutionaries, far ahead of their times. The very fact they were both leaders of masses of mankind in great nations place them in a kinship. Both had fierce devotion to their principles and had much in common. Even in personal characteristics they had much in common. Both eschewed personal comforts, practicing asceticism and simplicity in their lives. Both were born nearly it the same years (Lenin was just six months younger than the Mahatma). Both were deeply inspired by each other. Both left home to study law in England. Both became more involved around World War I; Lenin before and during with revolutionary ideas, and Gandhi after with the Non Cooperative Movement in 1922. The Mahatma and Lenin never met each other, but there are a number of similarities that come to light when considering the influence and the structures that supported the leadership of these two men. Both believed that the suffering of the majority humankind was mostly caused by the existence of an unjust social system which allowed one class of men to live upon the toils of the other. Both believed that the system had to be systemically destroyed. Lenin was of the firm belief that the unjust social and economic system existed because the exploiters held the power of the State in their hands. If that power could be transferred to the exploited by means of a revolution, a new awakening would happen and all the evils and wrongs would become impossible. 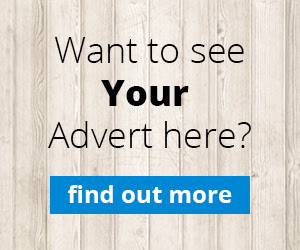 Lenin’s efforts were therefore directed towards securing such a revolution that would bring the State under the dictatorship of the proletariat. Gandhi however held a contrarian view. He believed that the root of the problem did not lie in the authority of the State, but in the character of the individuals which made the existence of the State possible. Those who ruled did so because the subjects were afraid of the rulers all the time. He believed that freedom would only come when the fear was thrown away. All his efforts were directed towards bringing about the necessary change in individual character; and this he did by his constructive economic and social programs, and by methods of non-violent non-co-operation.